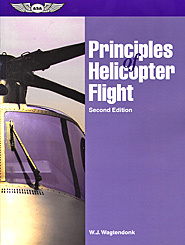 This book explains the complexities of helicopter flight in clear, easy-to-understand terms. It provides background knowledge as to why the helicopter flies, and more importantly, why it sometimes doesn't. It explains the aerodynamic factors associated with rotor stalls, mast bumping, wind effect, and many other important aspects of helicopter flight pilots are required to know. This 2nd Edition adds discussions of the NOTAR system and strakes, as well as the principles of airspeed and high altitude operations. Includes chapter reviews and practice exams. 304 pages, paperback.